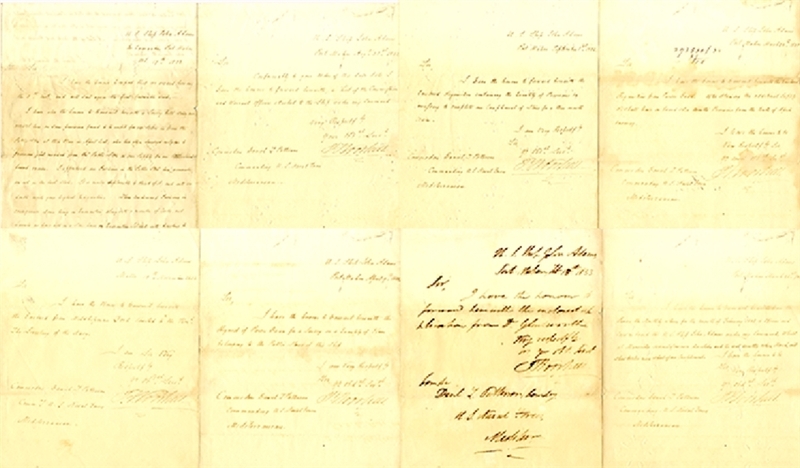 Group of eight (8) Letters Signed by Philip Falkerson Voorhees (1792–1862), Voorhees entered the navy as a midshipman on 15 November 1809, and was engaged in the War of 1812, taking part in the capture of the HMS Macedonian by the USS United States on October 25 1812. He was also present at the capture of HMS Epervier by USS Peacock on April 28, 1814 for which he received a silver medal from congress, and promoted to a lieutenant on December 9, 1814. The U.S. Navy stayed aloof from lower-South American troubles. On September 29, 1844, however, Voorhees showed himself to be quick-tempered and impulsive. He captured an armed Argentine schooner that delivered a mail to the Argentine commanding officer. This overreaction damaged the US-Argentina relation. He was tried by courts-martial in 1845 but the sentences of these courts were not approved. After a few months’ suspension President Polk, in 1847, restored Voorhees to his full rank in the navy and gave him command of the East India Squadron on the flagship Plymouth. He returned in 1851. Each letter is 1pp. quarto, 1832-1833, while serving on the USS John Adams, to Commodore Daniel Patterson, with varying content. Fine condition.